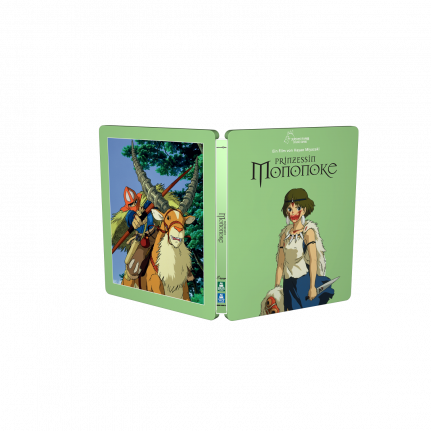 German fans of Japanese Studio Ghibli can now get the historical fantasy Princess Mononoke in a SteelBook® edition. The matte varnish is great on the pastel coloured artwork, which is strikenly different from the dark themes of this anime. The main character San on the front, while the warrior Ashitaka can be seen ready for battle on the back. A beautifully realized tale of civilization versus nature, PRINCESS MONONOKE is a true epic by Japan’s master animator Hayao Miyazaki. While protecting his village from a rampaging boar-god, the young warrior Ashitaka becomes afflicted with a deadly curse. 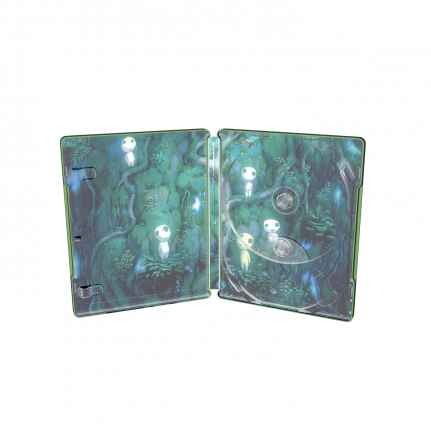 To find the cure that will save his life, he journeys deep into sacred depths of the Great Forest Spirit’s realm where he meets San (Princess Mononoke), a girl raised by wolves. It’s not long before Ashitaka is caught in the middle of a battle between iron-ore prospecting humans and the forest dwellers. He must summon the spirit-powers and all his courage to stop man and nature from destroying each other.